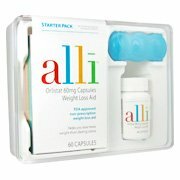 Alli (pronounced AL-eye) is the reduced-strength version of orlistat (Xenical), a prescription drug to treat obesity. It’s approved for over-the-counter sale to overweight adults 18 years and older. Alli is meant to be used in conjunction with a low-calorie, low-fat diet and regular exercise. Alli promotes weight loss by decreasing absorption of fat by the intestines, which reduces the number of calories you absorb. Lipase, an enzyme found in the digestive tract, helps break down dietary fat into smaller components, so it can be used or stored for energy. Alli works by disabling lipase, which prevents the enzyme from breaking down the fat while it’s in your digestive tract. The undigested fat continues through the intestines and is eliminated through bowel movements.